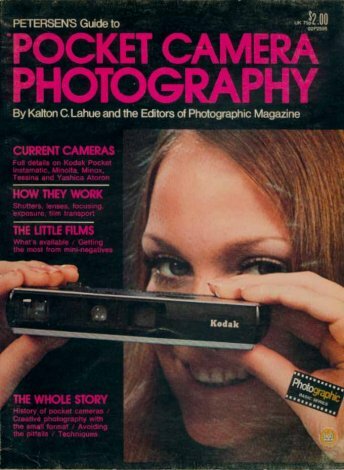 Kalton Lahue, Pocket Camera Photography, 1973, 80 pages, magazine style book. Similar to the 1976 book called 110 Format Photography which dealt only with 110 cameras. Pocket Camera Photography has an excellent coverage of the cameras smaller than half frame available in 1973. Chapters cover the Minolta, Kodak Pocket (110) cameras, Minox BL and C, Tessina and Yashica Atoron. Other chapters cover choosing a camera, selecting films, and developing film. SILVER, SILVER, ON THE FILM -- WHICH ONE IS BEST?